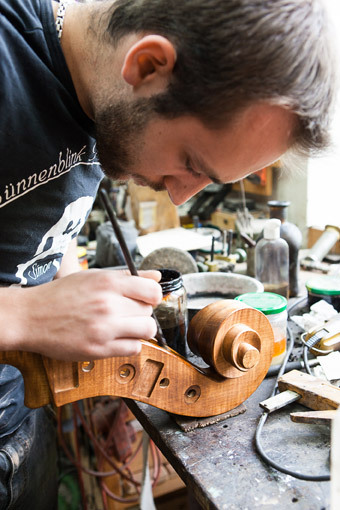 Our double basses are made with tender and loving care in our own workshop. Each instrument is unique. In order to convince you of the high quality and the unique sound our instruments possess, you are invited to visit our workshop any time or test an instrument at home. 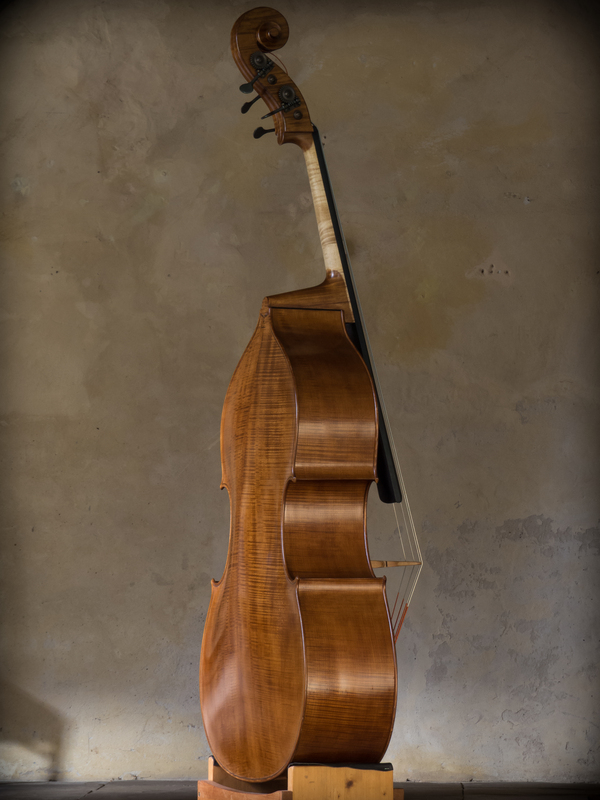 By the way – if you buy a higher-quality instrument from us, we will take back the double bass at its original price (less repair work, if necessary). Before buying you should read my General remarks on buying a double bass. Of course, we also have a wide variety of second-hand basses on offer. with the top reworked by hand, traditional brush-spiritus-varnish, Rubner mechanics, top-quality ebony fingerboard, special bridge, special tailpiece and first rate strings. Sorry, we can’t offer this basses in time! All our NOBLES, ROYAL an SEMI – Basses are 100% made in Germany! These instruments, which use European woold and are prepared in Germany according to my own drafts, have tops reworked by hand. Due to this individual treatment, the sound quality of these basses can hardly be distinguished from those being entirely hand-made. The top will be exactly balanced to make the bridge point its centre of gravity. The timber is of excellent quality. 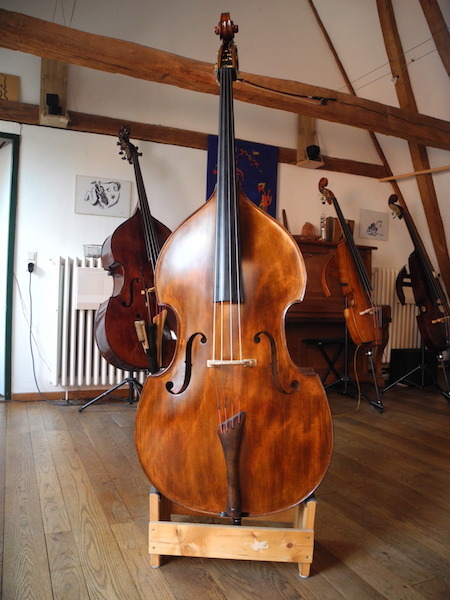 This is new: the first double basses with a protruding bass bar. In the course of the last 25 years I have restored many old basses and I often noticed that the bass bars had been left while the top was worked on. And what is more, the inner surface was irregular. The tops, although mostly more than 200 years old, were not warped. The instruments had an excellent sound! 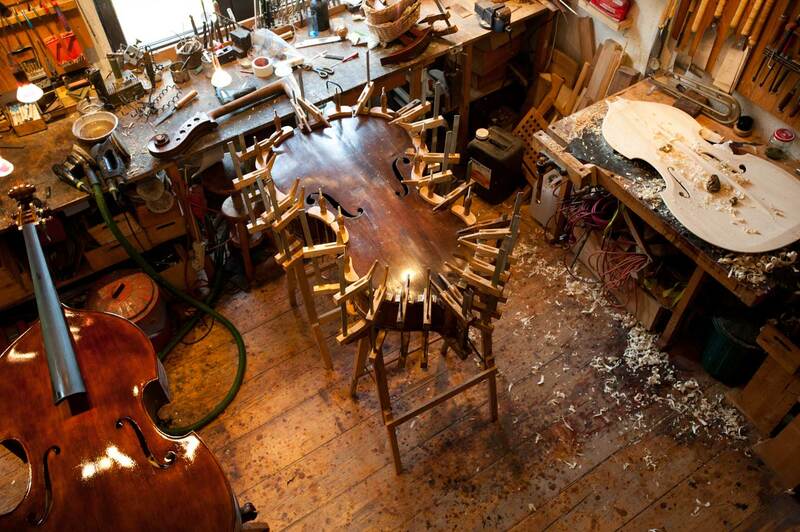 When I have new double basses in my workshop I often notice a coarse response. I put this down to the absolutely even inner surface because the instruments produced a better sound when their tops had been mended. Fortunately I found a person who was able to prepare the bass tops for me to work on them. The new Nobles tops have a protruding bass bar (top and bass bar are one single piece of wood) and an irregular inner surface for the natural vibrancy. Prices vary according to the materials. Nobles double basses are also available in 1/8 – 1/2 sizes! Very fine maple, nicely flamed, carefully selected tops, with protruding bass bar (completely tension-free), resmoothed by hand to make the inner surface slightly uneven as is the case with many old basses I have restored over the last 25 years. Top vibrancies are reduced. Double grooved, crown, timber tuning pegs or antique mechanics (lion´s head if requested!). We also make Models inspired by history Bassmakers like Matteo Goffriller or Paolo Testore. We use sometimes Ash, Poplar, or Nut tree for our “Royal” Series. We also have a range of completely restored double basses to try in the studio. Please ask! Our Semi-acoustic Double bass is now successfully in use nearly world wide. Solid top, spruce top with protruding bass bar. The first upright bass which produces an enjoyble sound unplugged, so that nocturnal inspirations can still be neighbour-friendly. If amplified it really does sound like a real bass, even when played with a bow. Regular 3/4 scale. You can measure about 30 (pizz.) to 50 (arco) db, which is equal to the sound of a typical conversation. Every customer, no matter whether playing classical music or jazz, loves its sound, especailly when played with a bow. The first owners are delighted! Attention: we sell to daily price! Presto Black and Blue Label available! Other brands on request. Read more about strings and their characteristics here. Otto Dürrschmidt … fine in quality and pricing! Hoyer-, Dölling- und Penzel-Bows also available. Order the GT 10 Days for testing. – if you don´t like it, send it back! Sommernachtsrausch”, Liebesgedichte, Faksimile mit Illustrationen von Jegor Wyssozkij, handgebunden. “Double Double You” Wyssozkij / Windelband Duo, CD ca. 70 Min. ou may order via phone, fax, email or by post. Delivery plus postage and packing will be on account. What about visiting me in my castle (date by appointment only). Geben sie bitte ihre E-Mail-Adresse ein, um unseren kostenlosen Newsletter zu erhalten. Wir versenden unseren Newsletter unregelmäßig um Sie z.B. auf Termine oder aktuelle Themen aus unserer Musikwerkstatt aufmerksam zu machen. Sie können unseren Newsletter jederzeit stornieren. Eine diesbezügliche Anleitung ist in jeder Nachricht enthalten. Weitere Informationen dazu finden Sie in unserer * Datenschutzerklärung. * I have registered the data data privacy statement. I agree that my information and data are electronically collected and saved in order to answer my request. Note: you can withdraw your consent any time via email to heiner@windelband.de. ---3/4 size, high-quality spruce top, maple back and ribs, high-quality ebony fingerboard4/4 size, high-quality spruce top, maple back and ribs, ebony fingerboard3/4 size, fine spruce top, flamed maple back and ribs, ebony fingerboard4/4 size, fine spruce top, flamed maple back and ribs, ebony fingerboardNobles double basses are also available in 1/8 – 1/2 sizes! * Ich habe die Datenschutzerklärung zur Kenntnis genommen. Ich stimme zu, dass meine Angaben und Daten zur Beantwortung meiner Anfrage elektronisch erhoben und gespeichert werden. Hinweis: Sie können Ihre Einwilligung jederzeit für die Zukunft per E-Mail an heiner@windelband.de widerrufen.